Explanation: HiRISE - the High Resolution Imaging Science Experiment - rides on the Mars Reconnaissance Orbiter (MRO)spacecraft just arrived in Mars orbit on March 10. This sharp view of the martian surface from the HiRISE camera includes image data with a full resolution of about 2.5 meters per pixel - recorded from a range of 2,500 kilometers. In the coming months, MRO's orbit will be circularized through repeated passages into Mars' outer atmosphere, a process known as aerobraking, shrinking its orbit to an altitude of only 280 kilometers. At that distance, the HiRISE experiment should be able to image the Red Planet's surface at a resolution of 28 centimeters (11 inches) per pixel. In this first color image, the false colors represent HiRISE's visible and infrared imaging data combined. 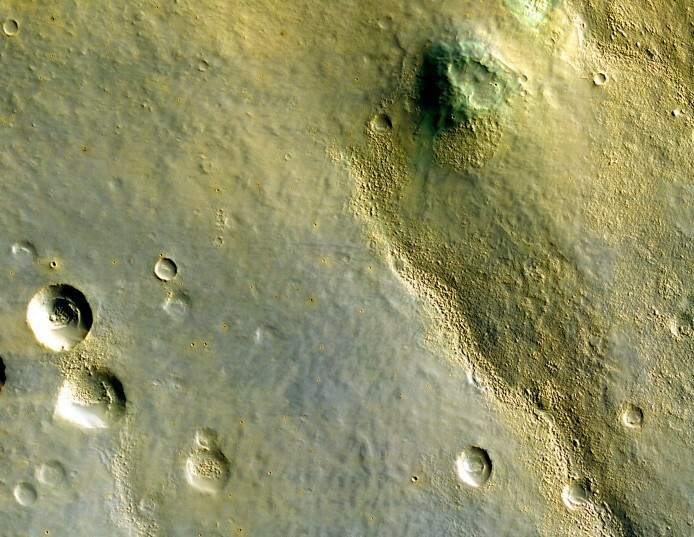 The picture is nearly 24 kilometers wide and covers an area in the Bosporos Planum region of southern Mars.